Dear Dave and Nick...: Letter 105: Maybe the Coalition believe dishonesty is the best policy? 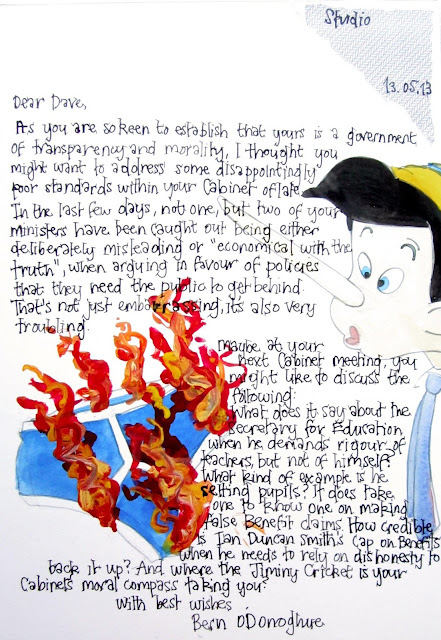 Letter 105: Maybe the Coalition believe dishonesty is the best policy? As you are so keen to establish that yours is a Government of transparency and morality, I thought you might want to address some disappointingly poor standards within your Cabinet of late. In the last few days, not one, but two of your Ministers have been caught out either being deliberately misleading or "economical with the truth", when arguing in favour of policies that they need the public to get behind. That's not just embarrassing, it's also very troubling. What does it say about the Secretary for Education when he demands rigour of teachers but not of himself? What kind of example is he setting pupils? It takes one to know one on making false Benefit claims. How credible is Ian Duncan Smith's Benefit cap when he needs to rely on dishonesty to back it up? And where the Jiminy Cricket is your Cabinet's moral compass taking you?